Beginning in July the Invisablend process for creating hair fullness will be available at All About Colour Hair Salon in Albany Georgia. “We’re excited to bring this unique concept for hair addition to Georgia. Many of our clients desire this truly unique process of adding hair that does not disturb the person’s own hair and provides a natural look and feel,” says salon owner Pam Smith. 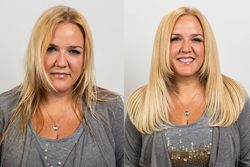 All other methods of adding hair, whether hair extensions and or hair replacement techniques have to either bond together (glue), tie down, or otherwise cover or shave off the existing hair in order to add hair. This new concept takes an opposite approach by respecting all and any existing hair when attaching additional hair. The advanced element of this new concept in hair extension and addition is that it feeds real hair in-between the person’s existing hair in a purely natural way – Hair threads called Translucent Blending-Strands® are used to feed single human hairs, one hair at a time onto these translucent hair threads, so when blended in-between the person’s existing hair, you then only see single real hairs appearing to be growing directly out of the scalp. These hair threads look and feel like an actual individual human hair, and they are translucent, so upon application to the scalp they become virtually invisible. Invisablend customers report it feels and looks as if there is nothing within their hair, and that gives a completely natural feeling. This new application concept can adjust to any hair situation whereas all other methods are design for specific hair problems. In addition this concept is also the first hair transplant enhancer – any person that has a hair transplant or is thinking about getting a hair transplant can now use the Invisablend process in conjunction with hair transplants, to deliver a fuller and more natural looking hair style. People that don’t have enough of a donor area when getting transplants, a very common problem with hair transplants, can now add hair to just the areas they want, while leaving all of their own existing hair and newly transplanted hair alone. Invisablend’s advanced hair addition concept is now being taught and licensed nationally to hair replacement companies, salons and hair transplant centers throughout the USA.